Premium Tuner Tongs: The silicone is 100% FDA Grade and BPA Free. It’s heat resistant to 249℃/480℉, and stain and odor resistant. 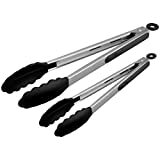 Our tongs heads offer the best grip and control available, and simply won’t melt, warp, rust or flake into your food like cheap metal tongs or nylon or plastic tongs. Designed with Thicker Steel: premium silicone and a smoother locking action. Homdox premium tongs are made with extra thick 1.00mm stainless steel from the handles all the way to the scalloped steel heads, which are then hygienically coated in silicone so there are no removable parts for bacteria to grow. With scalloped steel heads coated in silicone, Homdox tongs with silicone tips are firm and angled to offer amazing grip and control. Unlike pure stainless steel tongs, our silicone tipped tongs are non-stick friendly to protect your expensive pots and pans. Easy Clean and Easy Storage: Simply wipe under hot water or throw them in the dishwasher. The handles have soft ergonomic grips, and the ring pull lock means easy storage. Ideal Kitchen Tongs for a variety of foods, including serving and cooking foods such as salad, grilled foods, pastas, fruits and much more; Equipped with a new Pull-Ring technology keeping them from opening and closing at the wrong time facilitating control while using them making them easy to use and allowing storage with other Kitchen utensils. Homdox Silicone Tongs – Salad and grill stainless steel serving tongs with silicone tips have heat-resistant silicone heads that won’t scratch nonstick cookware. an innovative automatic locking mechanism allows for easy one-handed use. It’s a must have for your kitchen. – Whether it’s the heat resistant FDA Grade silicone, the 1.0 mm extra thick stainless steel. the unique locking bracket that ensures a smoother, more durable lock. – 100% FDA Grade, BPA Free silicone. Heat resistant silicone heads up to 480°F. Stain and odor resistant. – 1.0mm extra thick stainless steel for added strength and durability. – Non-Stick Frendly – Perfect for both non-stick cookware or grill. – Hygienic silicone molded onto scalloped steel heads so they do not come apart and nowhere for bacteria to grow. – Ergonomically designed silicone grips on the handles. Stiff silicone heads for firm grip and control. – Sliding Lock for convenient storage. Smooth-Glide Locking Brackets for a smoother locking action that will last years. – Easy clean and dishwasher safe.